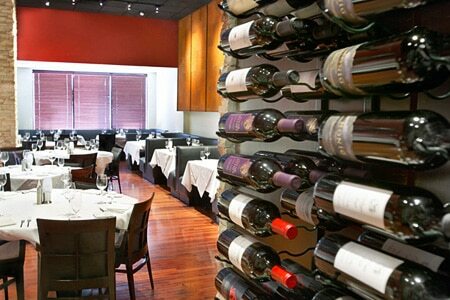 Beachwood’s Red, the Steakhouse focuses its culinary prowess on elegant simplicity and quality steaks. : With chefs Jonathan Bennett and Peter Vauthy at the helm, Red, the Steakhouse serves up a variety of chops and seafood dishes alongside indulgent salads and sides. Certified Angus beef is requisite, and while every cut --- including a New York strip, rib-eye, porterhouse and two sizes of filet --- is melt-in-your-mouth tender, meat is not the only thing on the well-tailored menu. Appetizers include a steak tartare topped with capers and shallots as well as a hot stuffed pepper in a flavorful tomato sauce. For entrées, diners will face a daunting challenge, choosing between the free-range domestic veal chop, prime cuts of beef and pastas that include a whole Maine lobster over angel hair. End the meal on a whimsical note with the donut holes served with caramel, chocolate and raspberry sauces. The wine list consists of more than 500 carefully selected bottles; servers are knowledgeable about pairings and happy to guide you through the possibilities. Also located at 417 Prospect Ave., Cleveland, 216-664-0941.